The Southern Ocean, also known as the Antarctic or Austral Ocean, comprises the World Ocean's southernmost waters. The Southern Ocean near the Antarctic Peninsula. Where Is The Southern Ocean? The Southern Ocean is a large ocean located at the southernmost part of the planet and surrounds Antarctica. Also known as the Austral Ocean or the Antarctic Ocean, the Southern Ocean has no clear boundaries despite efforts from the international community to define the boundaries. Nonetheless, according to the International Hydrographic Organization, the Southern Ocean is defined as the ocean whose waters are found south of the 60-degrees-south latitude with the natural boundary being the Antarctic Convergence. The Southern Ocean occupies an area approximately 7.8 million square miles making it the fourth largest ocean in the world behind the Pacific Ocean, Atlantic Ocean, and the Indian Ocean but is significantly larger than the Arctic Ocean. However, the size of the Southern Ocean is not fixed as the ocean is believed to be drifting by a few inches each year. Scientists believe this drifting is caused by the spreading of the seafloor, but the validity of this theory has not yet been conclusively established. The Southern Ocean occupies the entire South Pole and encircles the continent of Antarctica. Since the late 18th century, the Southern Ocean has been a subject of contention to cartographers and geographers with some accepting the existence of the Southern Ocean but some believing that the ocean is just but a southern extension of the Pacific, Atlantic, and Indian Oceans. According to the International Hydrographic Bureau, the Southern Ocean is the ocean whose waters lie south of the 60-degree-south latitude but other international scientific organizations such as the National Geographic Society do not recognize the existence of the Southern Ocean when issuing maps but depict the waters around Antarctica as extensions of the Indian, Pacific, and Atlantic Oceans. The Southern Ocean formed about 30 million years ago after South America and Antarctica separated and opened up the Drake Passage making the Southern Ocean the youngest of all the world’s oceans in geological scale. The waters of the Southern Ocean are distinct from the waters from surrounding oceans due to the presence of the Antarctic Circumpolar Current which causes the waters of the Southern Ocean to circulate rapidly around Antarctica, a fact used by International Hydrographic Bureau in their argument for the recognition of the Southern Ocean. The Southern Ocean’s proximity to the south pole causes it to experience one of the most extreme weather conditions with the sea temperatures coming just above freezing point, ranging between negative (-) 2 degrees and 10 degrees Celsius. The majority of the Southern Ocean is made up of deep waters with few areas having shallow waters. The depth of the Southern Ocean ranges between 13,000 feet and 16,000 feet. The deepest point of the Southern Ocean lies 60 degrees south and 24 degrees west at the South Sandwich Trench where the depth is 23,740 feet and is one of the deepest points of any ocean in the entire world. The ocean floor of the Southern Ocean has not been extensively explored. However, scientists believe that within the depths of the ocean floor are immense deposits of oil and natural gas, particularly along the continental margin. Other minerals believed to lie under the Southern Ocean are gold deposits thought to be formed by gravity separation in the sedimentary process. Manganese nodules are the other natural resource believed to exist beneath the Southern Ocean. The belief of the existence of huge deposits of Manganese nodules in the Southern Ocean saw many mining companies express their interest in making explorations the ocean. Due to the proximity of the Southern Ocean to the South Pole, the ocean experiences freezing temperatures. These below-zero temperatures lead to the formation of huge icebergs which float around the ocean with some being hundreds of feet in length. These icebergs contain huge amounts of fresh water which are estimated to provide enough freshwater for all people in the world for several months. The icebergs present a natural hazard to ships which sail around the Southern Ocean as a collision with a large iceberg can cause a shipwreck. According to the International Hydrographic Organization, the Southern Ocean is made up of 17 subdivisions. These subdivisions are all geographical features and include the Bransfield Strait, the Drake Passage, the Bellingshausen Sea, the Amundsen Sea, the McMurdo Sound, the Ross Sea, the Somov Sea, the Dumont D’Urville Sea, the Mawson Sea, the Tryoshnikova Gulf, the Davis Sea, the Cooperation Sea, the Cosmonauts Sea, the Riiser-Larsen Sea, the Lazarev Sea, and the Weddell Sea. Despite the cold temperatures, the Southern Ocean is teeming with marine animals and has one of the most diverse habitats of marine animals anywhere in the world. The marine mammals found in the Southern Ocean include the largest animals in the history of the world; the blue whale which is found in significant numbers around the ocean due to the abundance of Antarctic krill on which the blue whale feeds. Other marine mammals of the Southern Ocean are orcas, the Antarctic fur seals, Weddell seals and leopard seals. The ocean is also home to a variety of birds including the usual Antarctic resident, the penguin which has several species living in the Southern Ocean such as the emperor penguin, the rockhopper penguin and the king penguin. Other birds found in the Southern Ocean are albatross, terns, petrels, and gulls. Despite being located on one of the most remote regions of the earth and one of the least traveled, the Southern Ocean is still used in marine transport with ships traveling to Antarctica and therefore has several ports and harbors constructed in its shores. 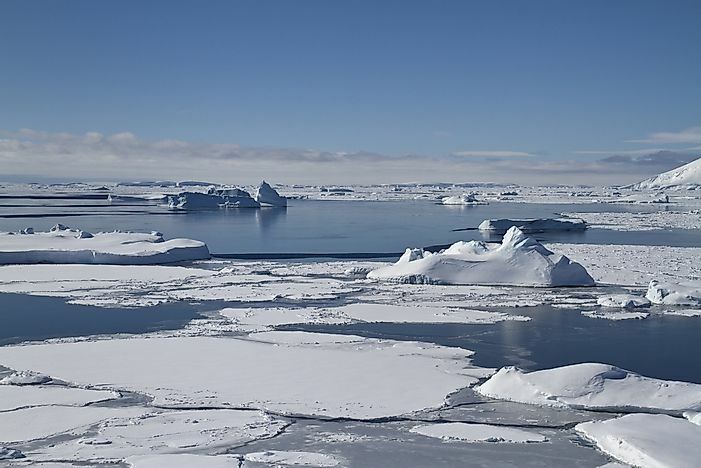 Some of the major ports include Mawson Station, the Palmer Station, and the Rothera Station. In recent years, the primary productivity of the phytoplankton has reduced by around 15% which is a cause for alarm as the phytoplankton is the main food for krill, a keystone species of the Southern Ocean ecosystem. Recent studies conducted around Antarctica have established that ultraviolet radiation from the sun has increased in recent years and has led to the decline in the growth of phytoplankton. The increased solar radiation emanates from an ozone hole in Antarctica and has also led to the alteration of DNA in some fish species.